Putting up a billboard in Petaluma can do wonders for your business, and Veale Outdoor Advertising can help! We’ve been involved in local business, real estate, and advertising since the 1980’s, so we know our stuff. Whether you’re interested in a versatile multimedia ad on Sonoma County’s digital billboard or would like to advertise a little closer to home, we’ve got the bases covered. When it comes to OOH advertising, the benefits are numerous. In today’s fast-paced marketing environment, it can be difficult to pin consumers down for more than a few seconds at a time. With the ability to fast-forward through commercials, block internet ads, and change the channel during radio advertisement, sometimes it seems impossible to break through. When it comes to outdoor advertising, however, the game starts to change. 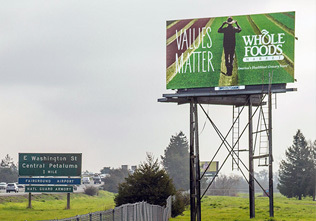 The 101 Highway through Petaluma is a regular commuter thoroughfare, which makes it an ideal location for a billboard. In the few seconds it takes them to pass by, drivers can be informed of your business, sale, or event, and given an immediate call to action – whether it’s to get off at the next exit or tune in for the latest lotto numbers. Local and national businesses alike use out of home advertising to reach new and repeat customers, as statistics show that longer commute times often correlate to higher household income. This is a market you can’t afford to miss! For more information about digital and traditional billboard advertising in the Petaluma area, contact Veale today. We look forward to helping you start your next marketing campaign with a bang!